The season of fall is just round the corner ladies and you might be wondering to! Have you set up your wardrobe already? Whhaat! Not Yet? When will you do it? Or maybe you would want to try this new DIY upgrading ideas for your favorite footwear. Fall is when you get ready for winter. Fall is when the world is full of bright colored leaves that look like jewels in the sunlight. . Fall is also, when you put away your summer wardrobe and start your almost-winter-is-here clothes. Here are these Chic Ways To Wear Ankle Boots This Fall. Oh my god! I am already so excited that I can’t wait to get my boots out and try them out! Must have footwear styles with endless shapes and colors makes your fashion more statement. A body suit, jeans that hug your curves and black ankle boots. Throw on a jacket casually over your shoulders and strike a pose! Show off those long legs with a mini skirt, a pullover, and some fancy ankle boots with a motif! Chic ways to wear ankle boots this fall just got started right. Those frayed jeans that end just above your ankles will complement the laced up boots. Wear some flowy scarves and a blazer or jacket to complete the look. Wear a solid colored top and jeans, and a denim jacket. Save the patterns for your boots – you will look every inch the celebrity. A smart mini dress and some well fitted ankle boots in matching colors. A snazzy handbag and hair around your shoulders is all you need to look smashing. Those turtlenecks and sweaters go well with some parallel trousers in beige or other neutral colors. Pair this with white ankle boots to seal the deal. 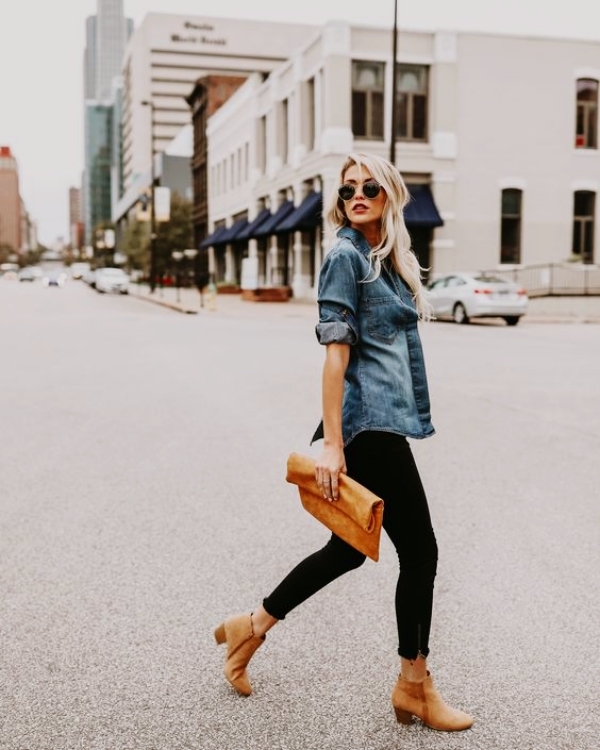 Your shirt, jeans, and jacket just got more chic once you wore a pair of ankle boots which look one colored, but turn your heel to show the pattern! Embolden yourself with a fitted leather skirt and matching ankle boots. Wear your hair up for a slightly more formal appeal. 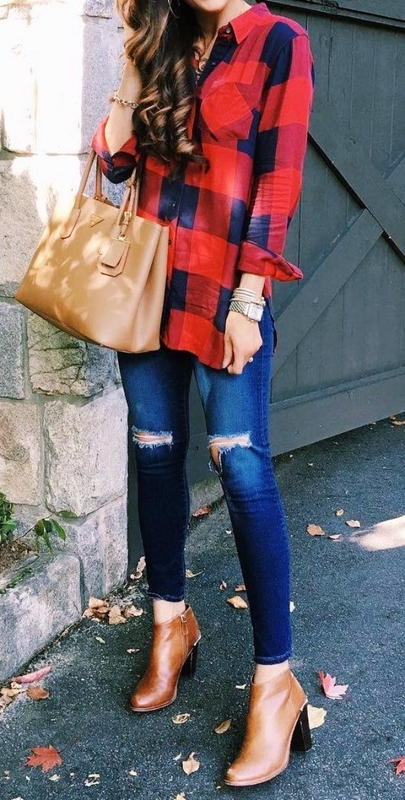 Chic ways to wear ankle boots this fall just keeps getting better and better. Go white completely except to carry a handbag in beige and ankle boots in black. Isn’t that a cool cat? A bright long coat worn over your top and jeans and a pair of ankle boots is a look that rarely fails. How about wearing a long striped skirt with matching apron over a man-shirt and then surprising everyone with ankle boots that have spiked heels? Do you like this naughty idea? Sport a casual getup with ankle boots that are like those peep-toe pumps. In fall, you can afford to do this without your feet getting way too cold. A pair of black stockings and your favorite short-length business suit worn with matching coat complements the pointy pair of ankle boots perfectly. You can be in New York in no time looking like this. Wear some checked dress and a solid colored long coat reaching your calves. A plain pair of ankle boots will add to the style quotient in a major way. A pair of ripped jeans worn with a frayed denim shirt and jacket and a sling bag for your essentials! What completes this look is the funnel shaped ankle boots in brown for an unusual combo. Your favorite white dress and a black lace pullover is a dream fall outfit. What you need to make it stand out are a pair of silver ankle boots. A shaggy sweater and a pair of non-descript trousers will fool everyone until they look at your feet to see a pair of golden shiny ankle boots that you wore for a surprise! These ideas should have given you some ideas of your own. Try them out before falls fades out to winter with chic ways to wear ankle boots this fall.